The one that nobody really needs, but it's still neat to do. Draws barcodes in OmniGraffle. It looks simple, but trust me (or take a look at the code! ), it's not. If you feel so inclined you can discuss this script at the appropriate OmniGraffle Extras forum page. In the window that appears enter the numbers from the barcode. 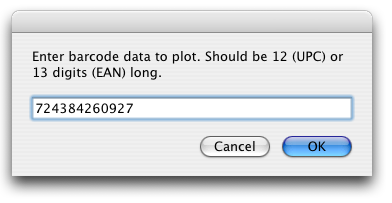 Include the single digits to the left and right of the code, if there are any. Hit OK... and the excitement begins. The bars of the barcode are grouped for your convenience. If you have a barcode scanner, or an iSight, and Delicious Library (even a free trial version - fun to play with), then you can type in the numbers into the script, then scanning the barcode right off the screen. Without the use of two mirrors (one would present a reversed barcode, and probably not scan) this "scan from screen feature" is not directly compatible with Macs such as the Intel iMac or MacBook Pro with a built-in iSight camera. The astute reader may notice some scope for optimisation of this workflow, namely just scanning the original barcode into Delicious Library, but it's a much less exciting technology demo I think you'll agree. The script does not currently draw the numbers. I mostly just wanted to show off what I'd written, but don't really consider it very 'finished' yet. Inspired by an online barcode drawing thing, where they also have a great thing that tells you 'stuff' based on an Apple hardware serial number (which was what I was looking for in the first place before I got sidetracked). Initial release. Apparently works with OmniGraffle Pro version 4.1.2 beta 1.